I’m not quite sure where the time has gone, but it’s now been over a year since ‘There’s something about Mill Road’ entered the blogosphere! It started as a hobby that I hoped a few people might read from time to time, but I have been – and continue to be – amazed by just how much interest there has been in my ramblings, not just from the Mill Road area itself and Cambridge, but across the UK and even beyond. Since the Earl of Beaconsfield changed hands last year, the pub has been transformed into the place to be for music, with weekly events including the Monday night Open Mic sessions and regular Saturday night gigs – tomorrow you can catch the Watertight Jazz group and on 17th August following on from the Great Eastern Street Party, you can catch The Great Eastern Street Preachers. They have successfully carried on the tradition of serving the best pint of Guinness in Cambridge (which you’ll be pleased to hear I’ve tested and personally verified, all in the name of research…!) and also now do sumptuous stone-baked pizzas. Susie & Matt at the Beaconsfield have very kindly offered £30 of vouchers for the giveaway! Frameworks have been catering to the picture framing needs of Cambridge artists and art lovers for over twenty years and moved to their Mill Road home back in 2011, but what may be less well known is that they offer free mountboard to local school and charity groups. I love that every two weeks there’s a new exhibition to look at in their window – one of my favourites has been food artist Jimi Kazak – and during the Romsey Art Festival (which runs until 17th August) you can see the work of local artist Sarah Blake. The lovely chaps at Frameworks have offered a £20 voucher for the giveaway! – 1 x £20 voucher for Frameworks, for the recipient to spend at their picture framing shop on Mill Road. – A £10 voucher for the Earl of Beaconsfield, entitling the recipient to a stone-baked pizza and drink. 1. Subscribe to this blog (which means you’ll be the first to hear about new blog posts, as you’ll receive a notification email) before the closing date, by entering your email address in the ‘Follow this blog’ section, near the top right of the home page. To let me know that you want this to count as your entry into the competition (or if you’re already following the blog) please add a comment at the bottom of this blog post (or instead of a comment you can send an email to theressomethingaboutmillroad@hotmail.co.uk) by the closing date. 2. Follow me on Twitter and retweet any of my Twitter posts marked #MillRoadGiveaway – only applies to posts on/before 21st August (you can retweet more than one post if you like, but it will only count as one entry for the draw). Rules: This giveaway is open to UK residents only and the winners will be independently drawn at random from all those who have completed step 1, 2 or 3 above by the closing date. Entry is free. Automated entries not accepted. The closing date is Wednesday 21st August at 11:59pm. The draw will take place within seven days of the closing date. When notified of their win, the prize winners will need to provide a UK postal address for their prizes to be sent to. In the event of being unable to contact the winner/s within fourteen days of the draw, another winner/s will be drawn. By entering the draw, entrants agree that in the event of them winning the competition their name and city/town can be published on this blog (and associated accounts on Twitter and Facebook). The first ever Romsey Art Festival starts on Saturday and will run until 17th August. The idea for the festival was developed by a group of artists at Cambridge Art Salon last year and over the last few months they have been busy organising and co-ordinating a whole host of events to run across the fortnight – including art activities, exhibitions and a market, as well as poetry, film screenings, music, workshops and talks. This Saturday looks set to be the main day of activity, with events taking place throughout Romsey and along Mill Road. There will be an Arts & Crafts Market organised by LittleBiggs – local artists Ceri Ann Littlechild and Dan Biggs – featuring jewellery, ceramics and various art works for sale, as well as portrait artists on hand on the day and also a live mural painting which everyone can join in. The market runs from 10am until 3pm at Hope Street Yard and there will also be food stalls there courtesy of local ice cream extraordinaire Jacks Gelato and burger experts Steak & Honour. A little further down Mill Road you can find Cambridge Cinema Shorts presenting films at Romsey Labour Club, including a children’s screening at 11am and a 15+ screening at 2pm. There’s also a Bento Workshop at the Junction from 12-3pm and a Creative Writing Workshop run by Patrick Widdess at the Bath House on Gwydir Street from 2-5pm; and if you missed the recent Cambridge Open Studios exhibitions then you can catch artists Susie Olczak & Harry Gray hosting their own open studios at 53a St Philips Road from 10am-5pm. Dr Doodleys Drink & Draw is a fortnightly meet up for local artists which started last year, and on 6th August Sa’adiah Khan will be hosting their next event – ‘Collabradoodle’ will look at challenging ideas of control and restraint in art and is at Hot Numbers from 7-9pm. The Cambridge Map Project will also be hosting various events (see the festival blog for more info and a full list of events) and if you’re planning to head down to the festival then do keep an eye out for new art works popping up around you – the event organisers were recently looking for residents and groups to donate the walls of their buildings for art. Rounding off proceeedings on 17th August will be a special closing party, hosted by Shindig. If you haven’t heard of Shindig before it’s a collaboration of alternative music, arts and entertainment and they host regular nights across Cambridge, including Mill Road. The closing party will be held at St Philip’s Church on the corner of Thoday Street, 8-11pm. It looks like there’ll be plenty going on and lots of new things to try – I love Japanese food and really want to go along to the Bento Workshop, but it’s on at the same time as the Creative Writing Workshop, and the Art & Craft Market… decisions, decisions! With my local mill knowledge somewhat lacking (all I knew was that there used to be one somewhere in the Covent Garden area) I thought the best person to ask would be well-known local historian and Romsey resident, Allan Brigham. Allan, a member of the Mill Road History Project, was able to tell me that the mill stood roughly where the Salvation Army shop, Sally Ann’s, now is; and that it was owned by a Mr Humphrey, a local miller/baker, in the 1820’s. In 1830 the mill was one of just a couple of buildings that stood in what is now the Mill Road area, though the arrival of the railway in 1845 eventually resulted in a lot of housing being built to accomodate the railway workers and growing population. Some of the historical records I have found say that the introduction of the railway led to in an increase in local flour-milling – suggesting the mill could have closed quite some time later – though another account says that the windmill wasn’t used after its sails were blown off in 1840. The picture above, courtesy of Allan, shows Cambridge University students playing cricket in 1842, and you can see the Mill in the distant background (it looks as though the sails might not be attached, but it’s difficult to tell). It is the only image I have seen of it, though the Mill Road Cemetery website has an image of Bakers 1830 map – which shows the site of the mill amongst the fields – and I am reliably informed that there are also other maps dating from between 1811 and 1832 available at the county archive. 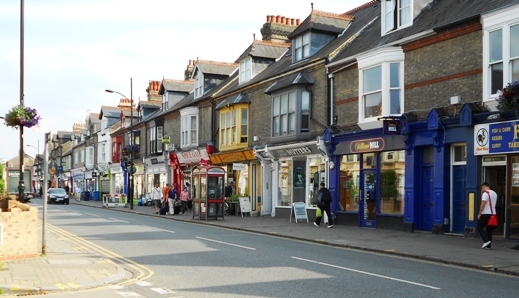 The mill gave its name to Mill Road and also Mill Street – which runs parallel to Mill Road on the southern side and is joined to it by Covent Garden and Mawson Road. As well as the mill, the site of Sally Ann’s was home to Cambridge’s first supermarket (Fine Fare) which opened in the 1960’s; and home to Cambridge’s first purpose-built cinema (The Playhouse), which opened a hundred years ago. Although the cinema closed in 1956, you can still see the coin marks, names and initials that were carved on the wall by queing cinema-goers – I am not sure if this was seen as vandalism or graffiti at the time, but I think it’s a great visual example of local history and I hope it’s preserved for many years to come. Although there is no longer a mill here in the Mill Road area, there are still a few in the county and many of them – including Impington Mill, Bourn Mill and Hinxton Watermill – are opening their doors to the public this weekend for National Mills Weekend (the nearest mill I am aware of is Chesterton Mill on Frenchs Road – although it’s not technically a mill anymore as it was converted into office space in 1986, its flour-milling business having closed in 1955). There will also be a history exhibition at Sally Ann’s on Mill Road, from 13th – 25th May, with information and photographs about the history of the Salvation Army building; and I will be going along to see if I can find out any more information about the mill. Open 9.30-4.45pm Monday to Friday and 10am-12.45pm on Saturdays. Today I went along to the Council’s Mill Road Exhibition at Bharat Bhavan. I was immediately offered a lovely hot cup of tea – which was very much appreciated given the cold weather! There were a number of stands with information about many of the local community and residents groups in the area, as well as proposals for a traders association; and in the middle of the room was a giant map of Mill Road where people could jot down their ideas on sheets of tracing paper (which could be placed over the map) There were also some beautiful paintings and drawings of Mill Road by a couple of local artists. It was great to see lots of ideas from locals and there were all sorts of suggestions ranging from peoples ideas for more green space around Mill Road and a regular local market through to thoughts on the 20mph zone and improving the area for cyclists. I spoke to Ceri (Mill Road Co-ordinator and organiser of the event) and she told me that it had been well attended over the two days – and judging by the many post-it notes I saw this was most certainly the case! I jotted down my ideas, which included widening the pavement on the northern edge of Mill Road on the town side of the bridge (opposite Arjuna, Fagito’s, Nip-In et al) as it’s not currently wide enough for two people to pass each other without one of them having to step into the road. I’d also like to see cafes and shops being allowed to have tables and chairs outside (even if just one or two tables) as this would give people more of an opportunity to interact with and chat to each other and make the area even more welcoming in the summer months. I also drew a design for a new housing co-operative which could go on the site of the Mill Road Depot (which is moving at some point in the next few years). This is an idea that was suggested by a number of people in the Local Plan consultations last year and I think it would really work for the whole community – especially as there’s a huge lack of affordable housing around Mill Road. I envisage something like a mixture of flats for single people and couples, and houses for families (little or no shared housing) on the back part of the site (furthest from Mill Road); this would have lots of green space and could house around 150 people. There would also be plenty of shared community space and at the front of the site a meeting area/hall that the co-operative would share with the whole community for free, as well as an upstairs area that could have free/low cost office space for local businesses/home-workers. There would also be a large outdoor area that could host community events such as barbecues, regular markets and other community activities. Bharat Bhavan, Regent College and other non-council buildings would of course be retained. By their very nature co-operatives are green and sustainable communities that are self-run, so the community would have the opportunity to shape and innovate their own housing and community space. In fact I suspect this deserves a blog post all of its own (!) so more on this another time. I was glad I went along to the exhibition and I now have lots more ideas for Mill Road. If you missed out you can contact Ceri (millroadcoordinator@gmail.com) for more information. I will write another blog post soon about what will happen to the ideas and how to submit any other suggestions you may have. I think the exhibition was a really good idea and it has given people the chance to have real input into their local area. There will be an exhibition on Mill Road later this month open to traders, residents and anyone with an interest in Mill Road. It is being organised by Ceri Littlechild – Mill Road Co-ordinator – and the main focus will be to look at forming a traders association for the area. Ceri is keen to hear from both traders and residents what they think of the idea of setting up a traders association for Mill Road and their suggestions for how it could work. Part of her role involves developing an action plan of projects that will help promote and enhance the area and she is also keen to explore ideas for improving Mill Road in general. The exhibition will include a Great Table (the idea of 5th Studios, based at the nearby Dales Brewery) which will be an aerial view map so that people can visualise and discuss ideas; and the Cambridge Association of Architects will also be on hand to meet locals between 10am and 3pm on both days. There will also be exhibition stands with more information about Mill Road and some of its existing residents/community groups (there are many, and I hope to blog about each of them over the coming months…) as well as the Mill Road History Project and information from Visit Cambridge (the Council’s tourist information service). The event will be across two days – Friday 18th and Saturday 19th of January – and will be open from 9am to 7pm on both. I shall definitely be popping along at some point (probably the Saturday) and am keen to see the aerial map as it will help with imagining how some of the ideas could look if they were put into practice. If you’d like to find out more then you can contact Ceri by email (millroadcoordinator@gmail.com) or if you’re free on 18th/19th January then just drop in and say hello to her!